Agroecology is a paradigm for scientists and farming communities that prioritizes food production, environmental stewardship and social responsibility. Agroecological innovations build from the resource-constrained ways we farmed before synthetic fertilizer with a modern design to sustain production, conserve natural resources, and maintain social stability. Agroecological practices maintain agricultural systems, or ‘agroecosystems’, to promote environmental health and biological diversity. The broad framework of agroecology aims to understand the ecological, evolutionary, and socioeconomic principles and practices to support the advancement of agroecosystem and food system sustainability. the framing of agriculture as an ecological system. the sustainable production of food, fiber, fuel, and medicine. farming that emphasizes the benefits of diversity. the maintenance of resilient agroecosystems. UF Agroecolgy was launched in 2012 as a graduate program to broaden the training of students as a collaborative effort between the Agronomy Department and the Soil and Water Sciences Department. Since then, the Agriculture and Biological Engineering Department and Entomology and Nematology Department have helped expand the program. Last year, the first lab dedicated to Agroecology was opened at the UF-IFAS Tropical Research and Education Center in Homestead. After a year of developing our research and extension program, we were curious what sort of needs and opportunities exist for agroecology awareness, adoption, and innovation. We started at home with faculty at TREC. What we found was a stark contrast in understanding between ‘agroecology’ and ‘sustainable agriculture’. The first question of the survey asked faculty to name the three primary goals for agroecology. To be clear, our desired answer is something along the lines of: sustain production, conserve natural resources, and maintain social equity. Many faculty quickly dismissed the question as too vague and challenging; however, after a couple of deep breaths and encouragement that they likely knew the answer, four of ten faculty members were able to offer an acceptable answer for the production and natural resources goals. Only one of ten named all three of the goals. Despite the discomfort with naming the goals of agroecology, everyone was able to offer a thoughtful and eloquent description of how their work promotes sustainability in agriculture. We have some work to do, but we are certainly moving in the right direction. We have developed this blog series to talk about agroecology and highlight the diversity of existing, yet underappreciated agroecological solutions. Our goal is to create a less ambiguous understanding of what agroecology represents, and how it is a universal and adaptable framework for agriculture and natural resource management. The elegance of agroecology is that it can be understood as a universal framework that broadly promotes sustainability in agriculture, natural resource management, and social infrastructure. The framework can be used generally to define the context of agriculture, natural resource, and food system challenges for developing specific place-based solutions. What agroecology means to all of us should be similar, but how we express and advance agroecology will be unique to each of our current strengths and weaknesses. One great example close to home at TREC is the effort to combat Laurel Wilt, a disease affecting the avocado industry and native trees across the state. It is transmitted by a beetle that lives inside the tree. This is an all-hands-on-deck sort of issue that requires a diverse team of researchers to understand the many facets of the disease and to develop a response for the many avocado growers of the region. How confident do you feel about describing agroecology? 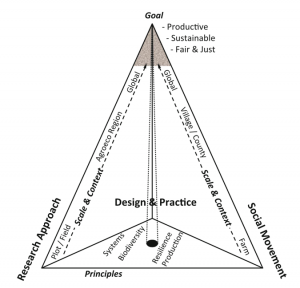 Do you use the agroecology framework in your work and lifestyle? Tell us about an agroecological innovation that you are excited about. Zack is Asst Prof of Agroecology at the Tropical Research and Education Center; Contact him at: brymz (at) ufl (dot) edu, 786-217-9238.